It must have been over four years ago that I got cute animal towels for Sara and Pim, and we’ve been using them ever since, day after day. 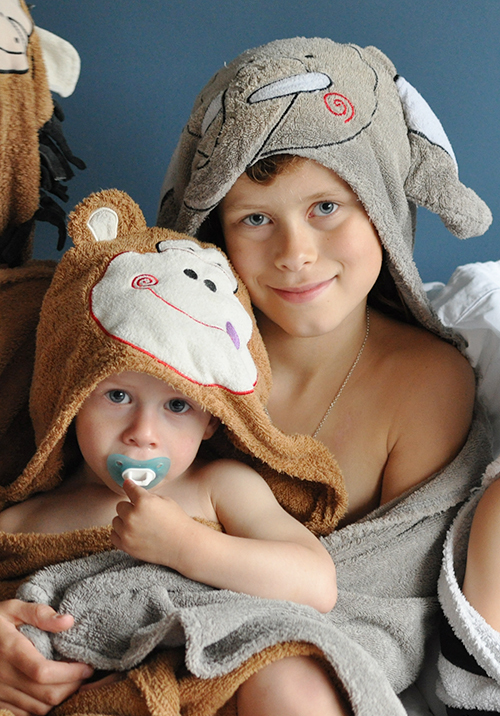 Sara the elephant and Pim the lion — it quickly became a tradition after each bath. So when Ava started to walk, we got her the zebra towel, and now we’ve gotten Casper the monkey — making our little zoo complete! 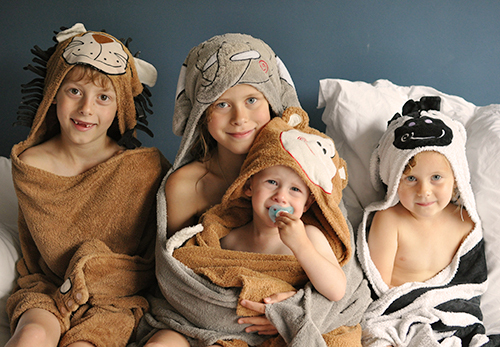 I love how these towels (from Zoocchini) are so royal in size, made from thick cotton, and have adorable details like ears and tails. There are even little pouches in which the kids can stick their hands/paws. Sara’s towel is sadly beginning to fall apart (not strange after all of these years of intensive use! ), and when I told her it might be time to replace it, she said that she wasn’t sure it would be worth the investment — after all she might be getting too old to have an animal towel for bath time… Eeks! I figured it was time for an immediate group photo before it’s too late! Love them! I see they only ship within the US. Or do you order them via an European retailer? I know! I ordered Casper’s towel when we were in NY for Playtime in February! Maybe you know someone in the US who can ship it to you? Or… you could try contacting Zoocchini directly? Ooooh Sara can’t grow too old for her elephant towel!! That would break my heart. Our babies are getting too big! Thanks Esther, a good friend of mine lives there, i’ll try that. Just how stunning… A they’re adorable, B they’re so beautiful!! !… totally captured their cuteness!! !